Indira Jaising: Supreme Court is "sitting on a volcano"; Pinky Anand: Supreme Court is Incorruptible. The occasion was the India Today conclave at Mumbai yesterday. We bring the important issues raised in a Question & Answer format. Rajdeep Sardesai (the anchor): One of the defining images of 2018 was that of four judges of the Supreme Court choosing to hold a press conference questioning the manner in which cases were being allotted raising question of credibility on the highest court of the country and the possibility of Supreme Court judges being split wide open. Is justice system in the dock? Is the highest court of the country incorruptible or is corruption a part of our judicial system right up to the Supreme Court? Are Supreme Court judges, at the risk of contempt of court, purchasable? Indira Jaising: I disagree with your definition of corruption. It just cannot be limited to purchase and monetary transaction..corruption takes many many forms especially in present day context and one of them is succumbing to the wishes of the executive. We live in a country in which we believe the executive and judiciary is separated and there is no interference. So in my opinion..yes, monetary corruption is definitely part of it but it does not end there..we need to look behind the curtain and see what is the relation between the executive and the judiciary..who is dominating whom? Is there any interference. Rajdeep Sardesai: The fact is that the 4 judges who held that famous press conference suggested that the Chief Justice of India was engaged in bench hunting. Just bench hunting take place or not? Indira Jaising: Yes, it does. Through the power to settle the roster. It does not belong to the democratic age and look it’s not this Chief Justice, the fact of the matter is every CJI has the power to decide which case can be allotted to which bench and by doing so it can decide the outcome of a case. Let us not get political about it ……we lawyers can tell that once a case is assigned to a judge, what the outcome is going to be.So if by bench fixing you mean handpicking the judges who are going to hear a particular case, then the answer is YES. Pinky Anand: There are two things. I would like to say that the Supreme Court is incorruptible. I think it is high time that we stop chasing and finding and say there is a possibility that the Supreme Court is corrupt. Yes, there has been a problem after Supreme Court judges went to the press…it is unprecedented. 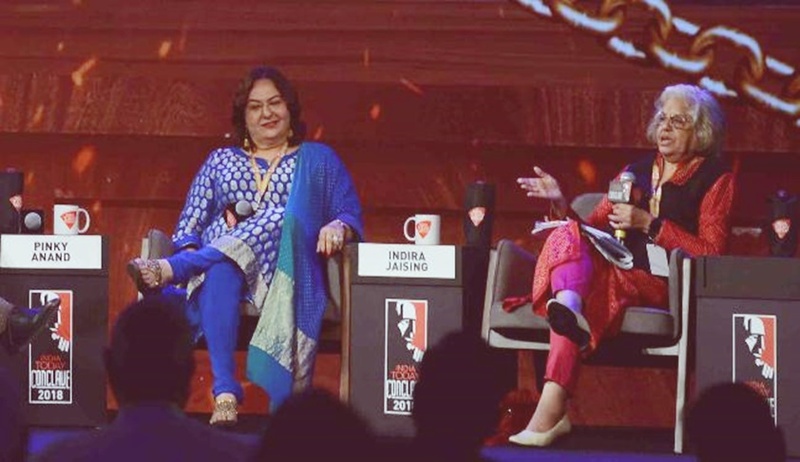 Pinky Anand: Yes it is incorruptible and we better stay with the institution and learn to stand with them instead of trying to find something behind the curtain. Yes, the press conference was unprecedented but whatever happened, now the working of the Supreme Court is going on smoothly in SC. There is a calm. We, lawyers, love to have a lot of complexity and technicality in talking about roster but when we have a system somebody has to operate it.There is a master of the ship and that is the Chief Justice who decides to which judge a particular matter is assigned. This has been the precedent and this has been going on and probably this will continue. It cannot be discontinued simply because some people did not find it inconvenient. For the time being, for example, Judge Loya’s case is being heard and the bench is hearing all sides. Rajdeep Sardesai: You mentioned the judge Loya case. The case of a special judge who officially died of a heart attack in December 2014. Questions have been raised if the death was natural. You believe given the sensitivity of the matter, the fact that political figures are being drawn into it, Congress is raising questions and SIT probe demand is being made, should such matters be viewed through a political lens or not or would it be purely judicial? Pinky Anand, you seem to suggest that when things are inconvenient, then aspersions are cast on judges. Pinky Anand: Absolutely. What have we come to actually. We have separation of powers and it is high time we learn to keep it separate. Judiciary decides on law and not based on sensitivities of a case. In Loya case you have family members who do not want to pursue this litigation who say there is nothing suspicious about it and you have district court judges report High Court judges report and in that case attempts are being made to convert it into a political platform instead of a judicial forum. I think we better stop that exercise. I think a line has to be drawn or else there will not be a judiciary with credibility. Rajdeep Sardesai: Is judiciary being politicized? Is judiciary politically split wide open? Indira Jaising: If at all the judiciary is politicized it can happen only at the stage of making appointments. It depends on who you are inducting into the judiciary. If you appoint people who are going to agree with you or your politics, your right-wing politics then judiciary is politicized. Today we have the collegium which recommended the appointment of Justice KM Joseph. Why is the government sitting on it? Six months have passed. Rajdeep Sardesai: So you say that the executive wants convenient judges who will fit in with their political ideology and are you suggesting it started only in 2014? Indira Jaising: No that is not my case. I am not saying it started only in 2014. I have written an article SC is sitting on a volcano. Pinky says even after the judges' press conference there is calm in the Supreme Court. But there is none. When I enter a courtroom my heart wonders which side of the fence is this judge on? Indira Jaising: That is another story. Pinky Anand: What is the sensitivity you are talking about? None of these judges are recent appointees any way. Indira Jaising: I think the judiciary is in the dock of ‘Janta ka Adalat’. It is time for the people of the country to wake up. Look at the judges' press conference. See they are sitting judges of the Supreme Court. They are not NGOs OK? No left wing or right wing. They are people appointed through due process of law. They are saying democracy is in danger. Answering your question if it is happening only after 2014, then my answer is No. It’s not that way its always been happening. but its time we call a halt to this. Rajdeep Sardesai: Pinky Anand, You are part of the government’s legal team. The fact is executive sits on judicial appointments that are inconvenient. Look at Gopal Subramanium case he appeared in a case against a BJP leader and he was denied judgeship. That is the harsh reality. There is something drastically wrong with executive-judiciary relationship today. There is tension which is not manifest but behind the curtain. Rajdeep Sardesai: But why is government sitting on it for over six months in Justice Joseph’s case? Pinky Anand: The government is considering it and you will soon have a response. Pinky Anand: No. executive is not interfering in the working of the judiciary.